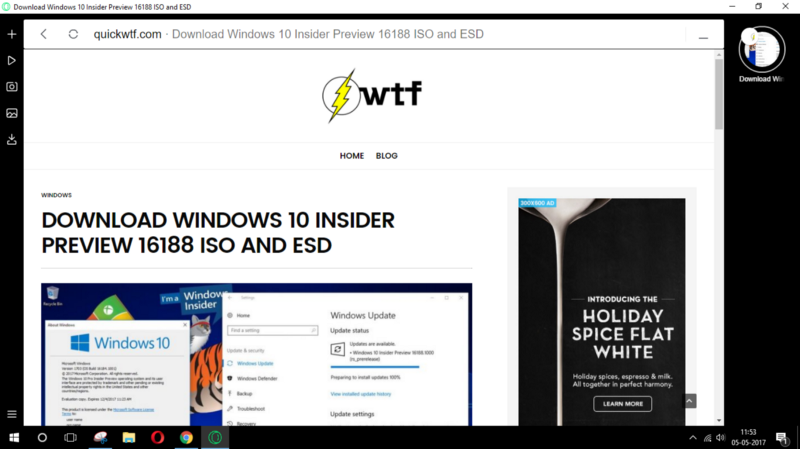 If you love your surfing Internet and don’t want to use Google Chrome, here is the best lightweight browser for your Windows 10 computer. Windows 10 recently released creators update allowing almost every PC user to update to it for free if they are on older Windows 10 build. It comes with 2 browsers, the one the IE, that nobody likes. The Edge browser certainly is a better browser we’ve ever seen from Microsoft in terms of usability and security. Yet Edge browser doesn’t have too many add ons or extensions like rest of browsers. Let’s have a look at memory and CPU efficient browsers so you can continue browsing web without any further thought. Midori browser is the official and default web browser of the elementary operating system which is based on Linux. (No, I am not advising you to jump to the completely different operating system. It also offers a Windows package that features the same interface. However, this browser can not handle heavy web browsing and you will not like its performance if that happens. In more general terms somewhere this browser is lightweight with very minimal user interfaces. It will not affect RAM management too much. The interesting thing is that this browser is available for almost all operating systems (If we do not talk about the mobile operating system). But if you are browsing heavily, then this browser will not be useful to you. Opera is again in the game, with some new features this can be your next preferred browser and there are solid reasons. You get in built ad blocker and free unlimited VPN so you can browse wider range of your favorite sites, in case some of them are blocked by your ISP. Moreover, it uses Chrome engine so practically you can use install any extension from Chrome Web store, although some extension work only in chrome for instance extension that uses speech API. Enabling that function is simple by installing this addon from opera store. Opera Neon is experimental, but it’s fast, thanks to the Blink engine that powers it. 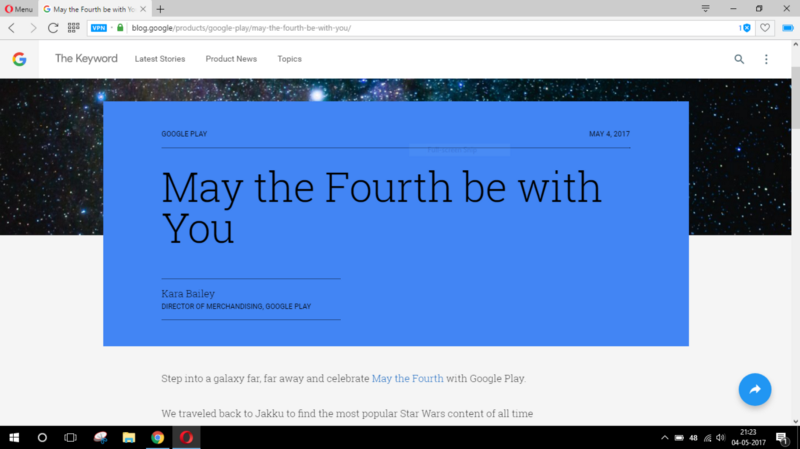 WIth some new concepts such as New tabs functionality and picture-in-picture mode, it revamped browser standards. Opera Neon made to almost all top major news site when released and received lots of praise such from TheNextWeb and Lifehacker. Opera Neon is different from Opera’s main browser. Many of the traditional things have been removed in this browser, and they have been replaced by the best and attractive features. Its main purpose is to make your browsing experience as easy as possible, so when you Opens the Opera, it automatically sets the wallpaper of your desktop in its background which almost eliminates the distortion between your desktop and the online world. Again it is not a beta or alpha version of the Opera browser, it is something new and experimental from the operating. What the Opera team has done is a very bold step, and we hope that in the future, the opera will continue to experiment with innovation. There are other things like a split screen that lets you work on two websites simultaneously. Opera Neon have more than we’ve written in this list, it’s something that you should experience. It uses its own DNS server to convert IP URLs into IP address, and the company claims that it’s fast comparing to other browsers DNS resolver. It looks just the same as Firefox browser and technically is same as you can install the Firefox plugin, add-ons etc. Further talking of security the browser itself run in a self-created portion that makes no contact with the system, so software won’t get installed and so they can’t cause virus and malware. This browser also bundles Webpage scanner and lots more. I used Maxthon for almost one and half year a few months ago, it bundled with a useful utility such as Screen capture, night mode, AdBlock, Magic fill (password manager) and the list goes on. You can choose between engines and it’s version 5 has also got Max note, Passkeeper, and UUmail. Vivaldi has got solid performance, and it is reliable. Vivaldi Browser uses Google chrome engine, but use far less memory than Chrome browser. Vivaldi has got some customization options such as themes, tab arrangements, take notes, etc. Torch, Vivaldi has got an option to schedule the theme to change automatically. It has beaten Mozilla Firefox in HTML5 test. This Windows browser is pretty young and has got some room for improvement. It’s build for Music and Video lovers so they can find it easy to play music online. And what more, there are a few other features such as Media grabber and Facelift (design facebook theme), but that also makes it an unprofessional browser, and I personally felt that adding pop-up on their main website just says the same. You can also use it to download torrents, but why bother when you can just use a cloud torrent service to do the torrent work faster and over an HTTP connection. Knowing the fact that the Internet is accessible via a Browser and you should use Veet lightweight browser to enhance your browsing speed while using fewer resources. Our favorite browser is Opera browser, and there is a solid reason for it, you love the battery saver is it actually works and then free ultimate VPN which ensures access to all the websites without any hassle. But that was our biased pick, you are free to choose and test any of mentioned Lightweight Web browser for your Windows 10 while utilizing less RAM and CPU power consumption.